Preheat oven to 180°C/350°F. Cut the two slices of bread into cubes. Transfer to a bowl, add olive oil and dried basil, and toss until evenly coated. Transfer to a baking sheet and bake for approx. 8 – 10 min. or until golden. In the meantime, trim the ends off the eggplants, cut into thick slices, and season well with salt. Transfer to a baking sheet, brush the slices with olive oil, and transfer to the oven to cook for approx. 35 min. 180°C/350°F, or until soft and cooked through. Once ready, remove bread from the oven and set aside to cool. Cut the mozzarella into thick slices. Stack the ham, use a cookie cutter to press into rounds, and set aside. Add ground hazelnuts and breadcrumbs to a deep plate and mix well. Crack the eggs into another deep plate, season with salt, and whisk well. Add flour to a third deep plate. Season eggplant slices with salt. Place two rounds of ham on top of half the eggplant slices, followed by a slice of mozzarella. Place remaining eggplant slices on top. Dredge each eggplant cordon bleu in flour, then the egg, and then the hazelnut-breadcrumb mix. To make the tomato and bread salad, quarter the cherry tomatoes and place into a serving bowl. Slice basil into thin ribbons, crumble in the feta cheese, add olive oil, and season with salt and pepper. Toss well and set aside. Heat vegetable oil in large pan set over medium-high heat. 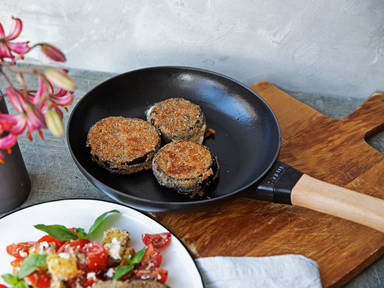 Fry the eggplant cordon bleus in batches for approx. 2 – 3 min. on each side, or until golden-brown. Remove from the pan and let drain on paper towels before serving with the tomato and bread salad. Enjoy!